Poet Vijaya Gowrisankar joins me today. We’re talking about her new collection of poems, Savour – Art and Poetry meet. 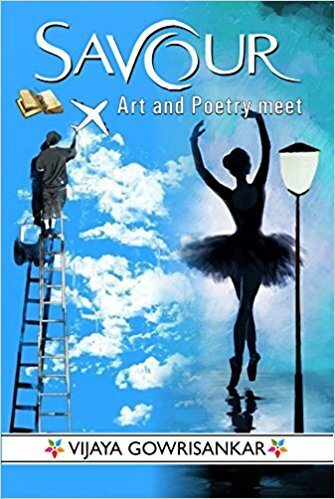 Vijaya’s fourth book of poems, Savour – Art and Poetry meet was published on April 30, 2017. Her first three books of poems, Inspire, Reflect, and Explore are best sellers. Her submissions have been published in Silver Birch Press, Nancy Drew Anthology, Poetry Marathon 2016 Anthology, Sometimes Anyway: Pride in Poetry Volume II, Forwardian, Triadae Magazine, iWrite India, Dystenium Online, and Taj Mahal Review anthologies. She has appeared as guest speaker in colleges. A participant in the Poetry Marathon 2016 (24 poems in 24 hours, 1 poem per hour), she has reviewed and edited poetry and fiction books. She participated in NaNoWriMo 2016 and completed her first novel in November 2016. Welcome, Vijaya. What do you enjoy most about writing poems? Poetry gives me freedom of expression. When I adhere to a poetry form, it gives structure to my thoughts and helps me enhance it. I love the ability to let my thoughts ride wings of freedom. Open Form gives me the most freedom. I learnt the Pantoum form in the Poetry Marathon 2016 last year. I love the rhythm of that form. Currently, I am writing one poem a day and submitting to anthologies. I hope to complete Poetry Marathon 2017. I am reaching out to readers about my fourth book Savour. Savour is a book of ekhprastic poetry, featuring 19 artists, 58 paintings, 73 poems in 20 poetry forms. I used to write in school. I participated and won many prizes in inter-school competitions. I used to send my poems to radio programs and some were read out in the shows. After that, I wrote at will, and sparsely. I resumed writing in full swing in June 2014 and since then I have been writing at least one poem a day. I guess on November 1st, 2014, when I decided to publish my first book, I considered myself as a writer / poet. I felt I was writing well and my readers would enjoy my work. They would be able to relate to my poems and I felt an acceptance in myself for this love of writing. I read a lot. I strive to keep each poem different, each theme different. I try to keep the content of each book different. I ask myself “Why would a reader buy this book? What does it offer differently from the rest of my books?” I am open to ideas and I try to connect with the pulse of contemporary writers, their opinion on what the readers want and the suggestions my readers give me. I keep thinking of what to write and zone off when I have a thought in mind. That becomes embarrassing when I am in the middle of a conversation. As a child, I was very unsure what I wanted to do when I grew up. I wanted to do everything – be a teacher one day, an IPS officer the other day, a writer when I read books by Enid Blyton, a tennis player when I watched tennis. I just wanted to be the best at whatever I did. Life just showed its course, and I followed it. I often hear “Poetry is dead” or “Poetry is hard.” The beauty of poetry is that it is open to the interpretation of the reader. Any art form – visual like painting, sculpture, cinema, dance, music or verbal like stories and poems has the power to touch the viewer or reader’s soul. It connects us with ourself. Each person should identify their creative interest and pursue that, rather than subduing it.